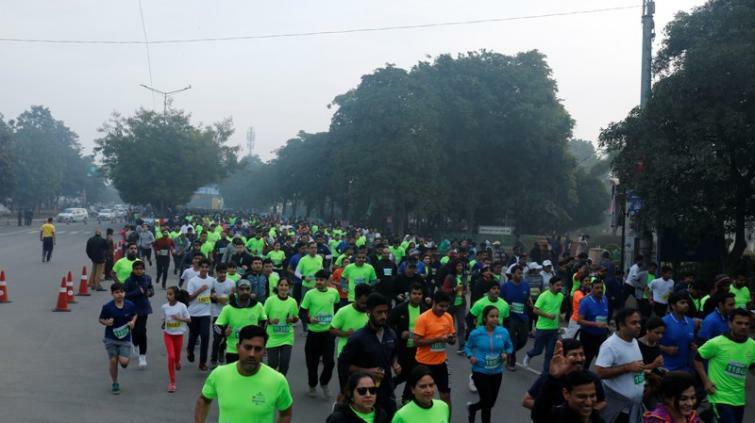 Gurugram, Feb 10 (IBNS): Creating a fitness and health trail at Leisure Valley Park, Sector 29, Gurugram, many sports enthusiasts, renowned international runners, CEOs, Doctors, Lawyers, students, senior government officials,socially conscious citizensparticipated in the Amity Gurugram Marathon on Sunday. The event is organised by Amity University Gurugram every year. Over 20,000 participants from over 35 countries ran in this coveted event which has become one of the biggest runs of Delhi NCR. Karan Singh clocked 2 hours: 24minutes to finish the full marathon (42.2km). The marathon brings together Corporate partners and NGOs to trigger action on social problems, thereby helps creates a positive impact on our society. “I am happy to see the enthusiasm and participation from various corporate teams, Corporates are realising the importance of taking care of their employees’ health and well-being through participation in events like these which helps not only in keeping them fit but also helps in team bonding,” remarked Dr Chauhan. “Bringing the diverse community together in such large numbers and raising awareness of social causes is a great outcome,” he added.